Important! If you need to add more items to your purchase? – Go back to MENU – Click on PURCHASE – Select item – And Repeat Process! LiketBaton “Shorty” – The LIKET is crafted from 100% solid Stainless Steel; it is designed as an “energy multiplier” that delivers high kinetic energy to the target with greatly reduced physical effort. LIKET is manufactured in lengths of 8.75″ or 10.125″. (10.125″ is abbreviated as 10″ in purchase “Drop Down” LIKET is easy to conceal in a pants pocket or purse, or can be made visible in a belt side pouch…and perfect for Molle gear allowing for very fast deployments. (8.75″ LIKET is recommended for pocket concealment) LIKET quality is beyond compare; the 100% solid stainless steel is coated with a grayish/black finish…the surface or substrates will never rust, pit, or degrade…virtually indestructible. 8.75″ Standard Weight 13.5 oz. 8.75″ Heavy Weight 17 oz. 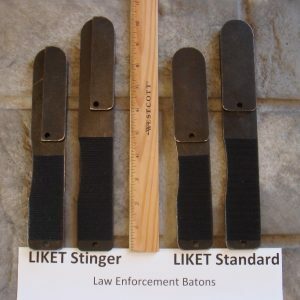 8.75″ Stinger – Standard Weight 13.5 oz. 10.125″ Standard Weight 15 oz. 10.125″ Heavy Weight 18.5 oz. 10.125″ Stinger – Standard Weight 15 oz. Standard LIKET vs. Stinger LIKET – The standard LIKET has a slightly larger striking surface area of between 3/8″ side-width for standard-weight and 1/2″ side-width for heavy-weight. The LIKET Stinger has a very thin striking surface area of only 1/8″ side-width – this creates a very thin “almost blade like” striking area; concentrating all of the massive kinetic energy onto one very small thin surface area. The Stinger striking surface is similar to the renowned and extremely painful thin edge of the Philippine Nerve Stick – but the LIKET Stinger is 100% solid heavy stainless steel…not a light stick! LIKET “Low Impact Kinetic Energy Tool” – LIKET is a Low Impact Kinetic Energy Tool because there is no need to use a lot of physical effort in a strike to gain compliance from a perpetrator. Even a medium tap will halt aggressive behavior; this is due to the tools “hammer like” weighted top-end…that is slightly “canted forward”, and the LIKETs’ 90-degree angle on all striking edges. The striking portion is a “squared off 90-degree edge”; the 90-degree edge concentrates all of the kinetic energy (All on one point with massive pressure) to a tiny impact area…extremely effective with very limited force. If you wish to add even more energy to your strike; consider the LIKET Stinger; with its thin “blade like” 90-degree edge. 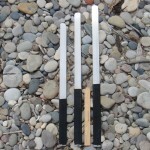 Package Description – This package includes one LIKET Baton, with instructions. Since many people place the LIKET Baton into their pocket or purse; the corresponding pouch is an optional purchase from the above drop-down. 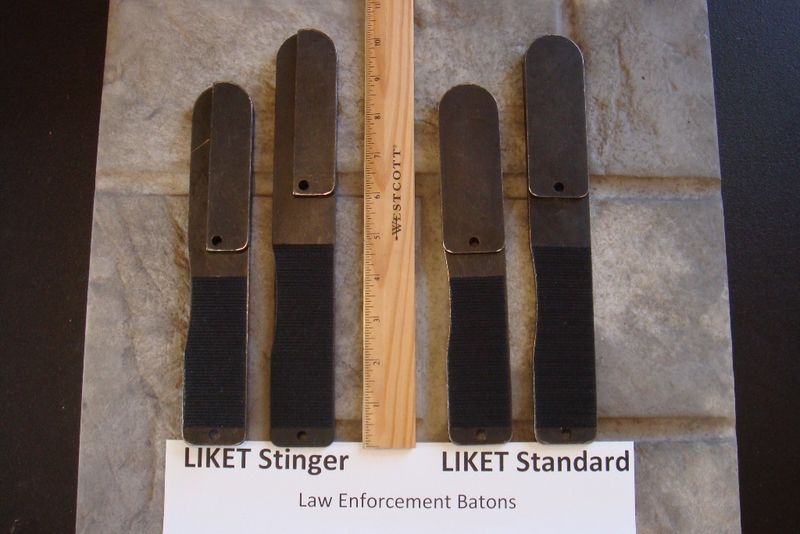 Less Than Lethal Tool – The LIKET Law Enforcement Baton – is designed as a “less than lethal” tool for law enforcement and civilian protection. The “top-heavy” hammer effect of the LIKET delivers much more power than the ineffective collapsible baton. LIKET is 1.5″ wide, and made of 100% solid stainless steel with a grayish/black oxide coating. Deployment – Most deployments of the LIKET Baton will come from a pocket, purse, belt pouch, Molle vest or Molle gear. The LIKET handle is made with Velcro that allows for easy attachment to Molle type systems, with an extremely fast deployment. Nylon Belt Pouch – Optional Purchase from drop down above. Molle Gear Not Included – But LIKET handle is made with Velcro hook, and is a perfect “drop-in” system for any Molle vest or related Molle gear! LIKET 10.125″ is abbreviated as 10″ in “Drop Down” purchase area above!